I haven’t been able to make it through more than a few pages before the app crashes. Definitely a bummer because there are things I want to read and can’t make it far enough before the crash. Glad I got a trial period before I was charged for the subscription. Went ahead and cancelled, I don’t need the hassle. I missed about three months of issues to technical glitches. A handful of pages or half pages would load and that was it. This app is not optimized for the iPhone Plus. This app is not optimized for the iPhone Plus, and thus it's content is enlarged and blurry. 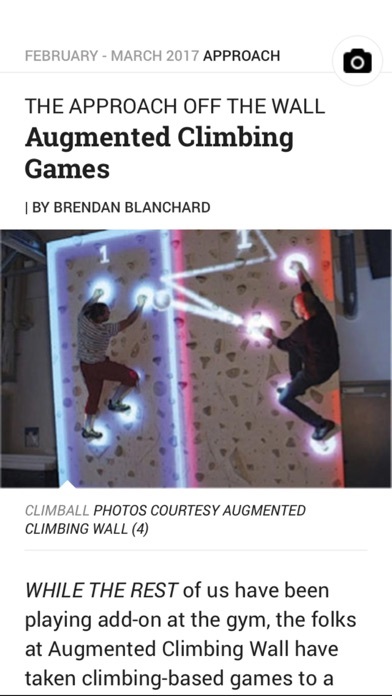 I assumed apps like Climbing would be better on the larger screen of the iPhone plus, but instead they are worse. Instead of being able to view more content, the buttons take up much more of the screen and everything is pixelated. LIVE all the content. 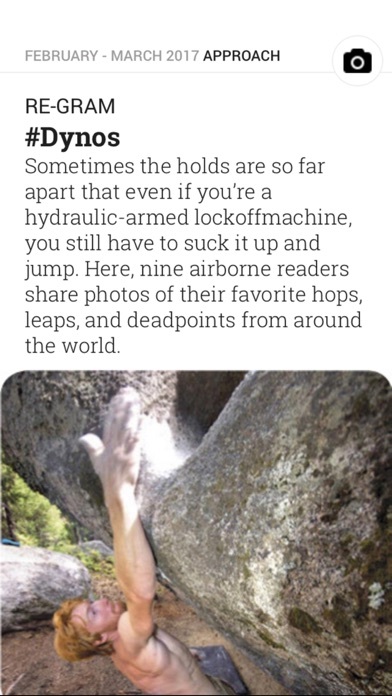 I'm an avid climber and I work at a climbing gym, and this magazine is super fun and helpful. The app could be formatted to be responsive and fit me screen though. 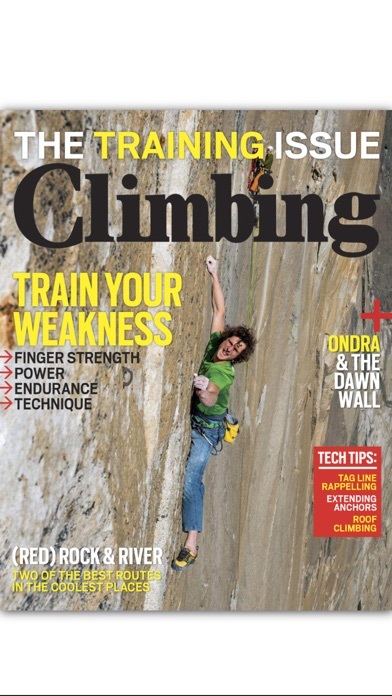 Other magazines do it; I wish climbing did so I didn't always have to zoom in. The content of the magazine is great, but the app is not appropriate for iPhone. The presentation is just medium-res page images, making is necessary to zoom to read anything but headlines, and sometime content is 3/4 or full-page width so it's basically impossible to read without zooming and swiping back and forth. On the other hand, viewing one page at a time it's impossible to take in some of the beautiful two-page spreads in the magazine. The zooming also coexists with page-turning, so my normal method for zooming on a specific part of an image on iPhone ends up turning the page--so instead I have to zoom, swipe, zoom again. Many of these things are probably fine on iPad. But you presumably still can't see two-page photos. I just downloaded it today and it's amazing. The photos are beautiful, and I love the articles. I thought this might be interesting, so downloaded. But all roads, so to speak, lead to "Buy" or "Subscribe." 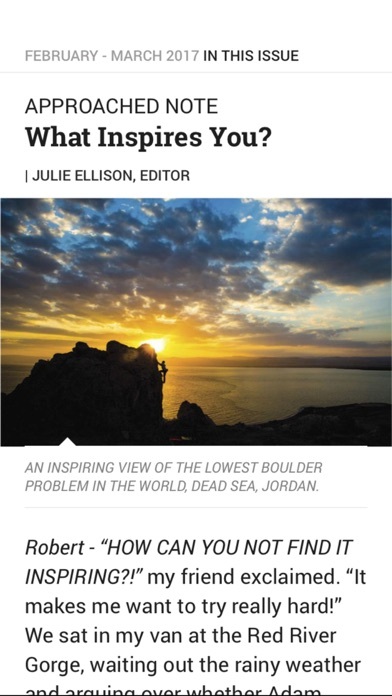 I like what you've done with the app and I never have any problems with it but it would be nice to be able to enjoy some of the beautiful images featured in this magazine in a higher resolution format. Great magazine, but text is so small on my iPad that my eyes hurt after a page or two. It looks basically like a PDF of the print magazine, fixed in a vertical format, without any way to magnify the print. One solution would be to show the pages in horizontal rather than vertical format on the iPad. Love the little extras—audio from photographers and video from athletes and editors. 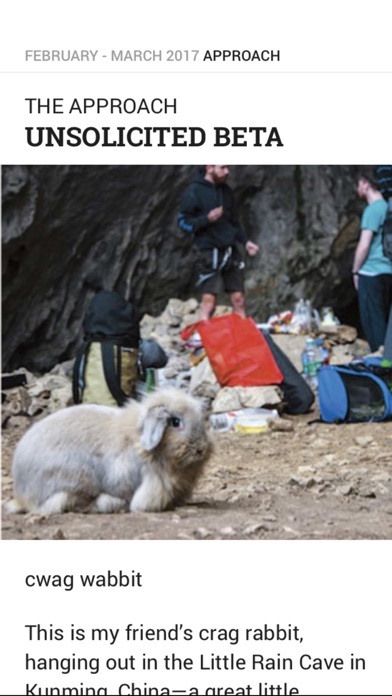 It’s no NatGeo but Climbing is doing things right.